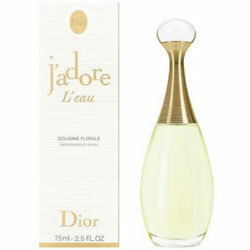 J'adore L'eau is a floral Cologne. The freshness of a Cologne signature enhances the citrus and floral notes of the Magnolia flower. Top Note - Calabrian Bergamot: Grown in southern Italy, the Essence of Bergamot is obtained by cold expression of peel. It brings a distinct, sweet freshness to J'adore L'eau and adds a special radiance to citrus notes. Heart Note - Magnolia: The Magnolia flower, with its pure white petals, symbolizes springtime, the time of renewal and perfection in nature. The radiance of the Magnolia is reflected in its unique fragrance, which is characterized by its citrusy-lemon notes and floral character. Base Note - Neroli: The floral fragrance of Neroli and Calabrian Bergamot is a traditional combination used in High Perfumery eaux de Colognes.